The Industrial Revolution – a term popularised by English economic historian Arnold Toynbee – signalled the seismic shift from a predominantly agrarian, subsistence-based economy to an increasingly mechanised, market-based economy, following the invention of the steam engine. The Information Revolution of the 20th century marked another fundamental shift, driven by computers and the internet. Now, once again, our industrial society is transforming though what I call the Syndustrial Revolution (or Integration Revolution), which is the confluence of innovation driven by smart, sharing and renewable technologies. We see this disruptive change occurring along intersecting fault-lines, namely the shifts from an atomised to a networked economy, from a surfeit to a sharing economy and from a linear to a circular economy. The Syndustrial Revolution – and in particular the shift from a linear to a circular economy – is the subject of a feature-length documentary called Closing the Loop, which I am currently filming together with Emmy Award winning director, Graham Sheldon. For the past 8 months, we have been visiting pioneers and prophets of the Syndustrial Revolution from around the world to record their stories and predictions. In this Closing the Loop article series, I will be sharing the insights we have gained from these practitioners and thought-leaders. More specifically, I will be unpacking what the Syndustrial Revolution really means, i.e. the business models behind the smart, sharing and circular economies. And I will be showing how companies and governments around the world are already taking steps to tap into this market opportunity, which Accenture analysis in Waste to Wealth by Jakob Rutqvist and Peter Lacy suggests could be worth at least $4.5 trillion by 2030. Fast-forwarding through the decades, we then saw the practice of life cycle analysis emerging in the 1970s (promoted by the US Environmental Protection Agency), industrial ecology in the 1980s (popularised by Robert Frosch and Nicholas E. Gallopoulos), cleaner production in the 1990s (promoted by the UN Environment Programme), cradle to cradle in the 2000s (conceived by William McDonough and Michael Braungart) and now, the closed-loop, or circular economy (being championed variously by the Ellen MacArthur Foundation, World Economic Forum and UN Global Compact’s Breakthrough Project). The sharing economy – a term popularised by Harvard law professors Yochai Benkler and Lawrence Lessig around 2004-2008 – also has deep roots, stretching back to concepts of the civil economy, co-operative movement and social economy (all coming into usage in the 1700s), and more recently, ideas around collaborative consumption in the 1970s (introduced by Marcus Felson and Joe L. Spaeth), the love economy (Hazel Henderson) and local exchange trading systems (Michael Linton) in the 1980s and transition towns (Louise Rooney and Catherine Dunne) and wikinomics (Don Tapscott and Anthony D. Williams) in the 2000s. So what is this Syndustrial Revolution really? 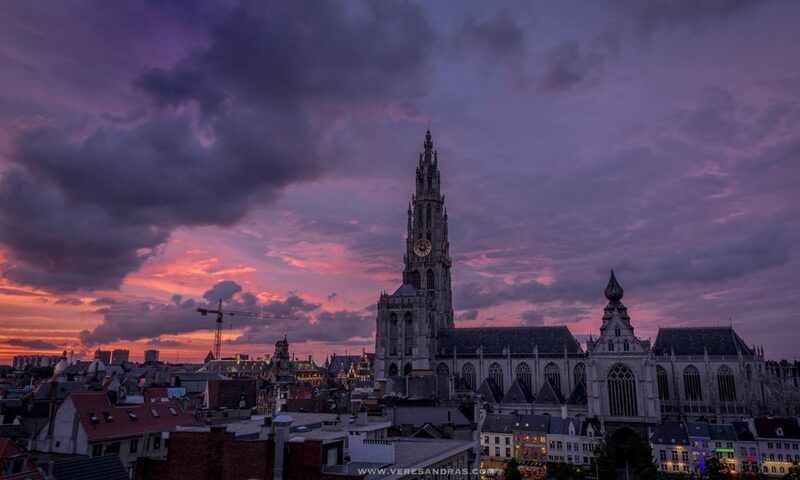 Is it smart cities and autonomous networked cars? Is recycling, or upcycling or zero-waste initiatives? Is it ride-sharing services like Uber and Lyft? Is it the shift from buying products to leasing services? 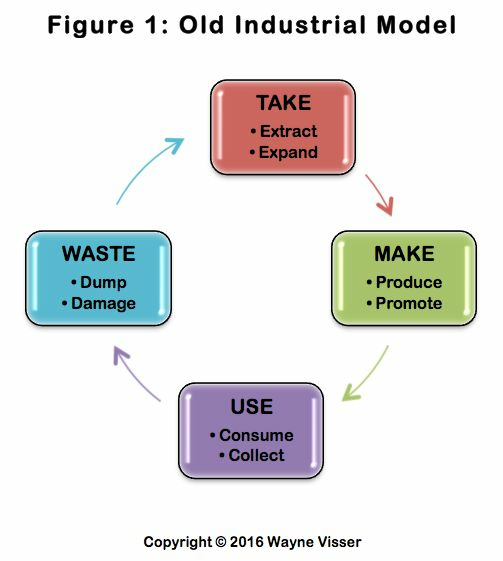 Is it moving from a take-make-waste linear economy to a circular economy? In fact, it is all these things and more, which is what makes it so confusing, not to mention jargon-laden. So I’d like to propose a simple model, which I will use to frame our discussion in this series. 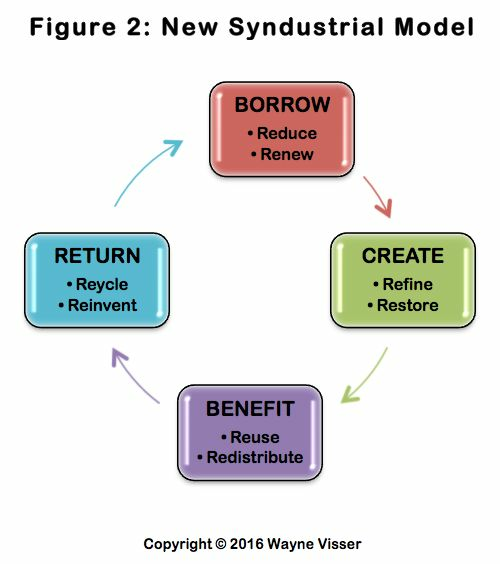 I call it the New Syndustrial Model, because it is really a new economic paradigm and set of business models to create better synergies in our industrial society. A high-synergy society does not build economic capital by destroying natural capital, eroding social capital and exploiting human capital in the way that our current win-lose-lose-lose capitalist system does. We Return – by using end-of-first-life (EOFL) materials to recreate the same products (Recycle) and to create new products (Reinvent). Over the coming weeks and months, I will use this model to share what we have discovered during our filming of Closing the Loop. To be sure, many companies and economies are still stuck in the Old Industrial Model and we have a long way to go before we reach the New Syndustrial Model, but our explorations have showed that not only is it possible and preferrable, but that this new industrial revolution is already happening. Visser, W. (2016) Closing the Loop: The New Syndustrial Revolution, Huffington Post, 17 Oct.